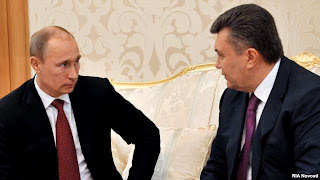 SOCHI, Russia -- President Viktor Yanukovych traveled to Russia on Sunday for a surprise meeting with his Russian counterpart Vladimir Putin to discuss urgent trade issues, Yanukovych’s press service reported. Russian President Vladimir Putin (left) and Ukrainian President Viktor Yanukovych (file photo). The meeting comes amid growing speculation that Yanukovych may join a meeting later this month of the top governing body of the customs Union, the trade organization of Russia, Belarus and Kazakhstan, in Astana. The developments follow Russian threats to impose trade restrictions on Ukraine if the country goes ahead and signs a free trade and political association agreement with the European Union. “We have a wealth of traditional relations - political contacts, economic ties and humanitarian. As usually happens in these cases, we have things to talk about,” Putin told Yanukovych shortly before their meeting in Sochi. Yanukovych responded that trade issues resonate with Ukraine and the countries should finally start making progress on the talks. "Whenever we can, we should address questions of this kind,” Yanukovych said. “We will work through traditional agenda today and we will slowly move forward." The surprise meeting comes less than two months after Yanukovych and Putin made little progress at a meeting in Zavidovo near Moscow on March 4. Russia has then refused to lower natural gas prices for Ukraine, Yanukovych said later in March, suggesting a greater progress would be made by the time of the next meeting in April, a meeting that had never materialized. Russia said earlier it would lower the prices if Ukraine joins the Customs Union, a Russia-led trade bloc that also includes Belarus and Kazakhstan. The joining of the Customs Union, however, would derail Ukraine’s plans for closer cooperation with the European Union, postponing indefinitely the free trade and political association agreement between Kiev and Brussels. The agreement may be signed in November at a summit in Vilnius, Lithuania, if Ukraine makes sufficient progress in streamlining its election and judicial systems. Yanukovych may join a meeting of the Supreme Eurasian Economic Council, the top economic governing body of the Eurasian Economic Union on May 29 in Astana, Kazakhstan, a source at the Yanukovych administration told Interfax. The Eurasian Economic Union is a broader economic bloc that in addition to Russia, Belarus and Kazakhstan also includes Kyrgyzstan and Tajikistan. “There is high probability that Viktor Fedorovych [Yanukovych] will come to Astana,” Mikhail Zurabov, the Russian ambassador to Ukraine, said Saturday. The developments come as Russia has recently intensified its pressure on Ukraine with threats of trade restrictions and other measures to punish Ukraine in the event Kiev signs the agreement with Brussels. “It makes sense now to talk about red lines that must be taken into account should the agreement be signed,” Zurabov said, adding that Ukraine has not yet fulfilled its commitments for signing the agreement.